A range of 419 exhibitors have already expressed interest in participating in the forthcoming Rwanda International Trade Fair. Coming as the 19th of its kind, this fair also referred to as Expo Rwanda is in high steam and a range of mentioned exhibitors from all over the world will safari to Rwanda to be part of it. According to Stephen Ruzibiza – the Chief Executive Officer of Private Sector Federation, the event comes with immerse opportunity to demonstrate the products especially the Rwanda Safari tour products which are available on the market. Besides the showcasing, the fair is also a perfect avenue for networking. The 19th Edition of the Rwanda International Trade Fair will commence on July 27th running through to August 10th at the famous Gikondo expo grounds. This fortunately comes in at a time when the country is embarking on rigorous positioning of Meetings Incentives Conferences and Events (MICE) programme to the portfolio of Rwanda tour products capable of generating foreign exchange to the country. The Rwanda International Trade Fair (RITF) has been happening overtime and gradually, it has continued to attract the International attention and so far a count of seventeen (17) countries have expressed interest in this year’s turn mainly from Africa, Europe and Asia. In 2015, the expo had 408 registered exhibitors but for this year, the number has increased to 419. The 271 of these exhibitors are locals while the 148 are foreigners. The success of the past exhibition is evidenced by increased foreign direct investment in Rwanda something that continue to yield job opportunities for the local people, enhancing the national revenue and contributing to economic growth and development. Interestingly, some of these investments are in the tourism and hospitality sector such as hotels which in turn increases comfort prospects of travelers on safaris and tours in Rwanda. Rwanda’s economy is apparently featuring an 8% annual growth rate of which the private sector has contributed considerably. Therefore establishing strong ties with the foreign world to facilitate technical and financial resource inflow would add strength to the private sector thus enhancing their input to national development. The anticipated sectors that will engage in the exhibition include; Agro-processing, Manufacturing, financial services, Handcraft, Tourism, financial services, SMEs, Housing and Construction. 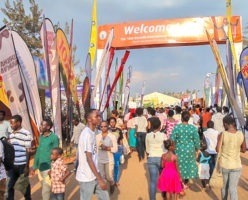 The Head of Trade Fairs and Investment at the Private Sector Federation Mr. Eprehem Karangwa noted that a range of 320,000 visitors are anticipated to reach at this year’s exhibition with 20,000 people making it to the event every day. The expo will be broadcasted live and among the notable new exhibitors are from Turkey and United Kingdom.